The taste of spring becomes sweeter each day. Birders and photographers met at Britannia, where Red-winged Blackbirds, Northern Cardinals and a single Song Sparrow entertained us with their beautiful song. We were surrounded by spring-like activity with some birds carrying nest material, others claiming their territory and others in courtship. The best birds of the morning were a Killdeer flying over head, Hooded Mergansers on the river and a pair of Northern Pintail near the marina. We moved on for a little drive to March Valley Road. Here we found Pileated Woodpeckers, Green-winged Teal, Red-tailed and Rough-legged Hawks. As the day progressed, the fog lifted and we had beautiful blue skies with warm comfortable temperatures. There’s not many winter-birds left, but luckily Tony spotted a Northern Shrike. 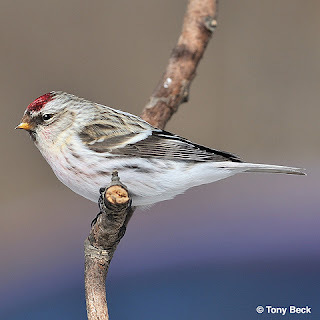 We went to the Hilda Road feeder again to see if we could relocate the Leucistic Common Redpoll from Tuesday’s excursion, but we could not. 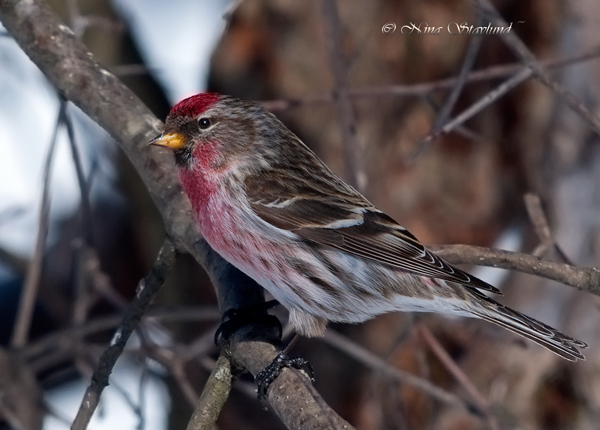 Although there was still a lot of redpolls we could only find two Hoary Redpolls. Never the less, it was a super day, which also included Turkey Vulture and Bufflehead, amongst other things.